One of the benefits of home education is that we can match our curriculum to the kids energy levels, the weather and what happens to be going on that day. Today was warm and gloriously sunny. 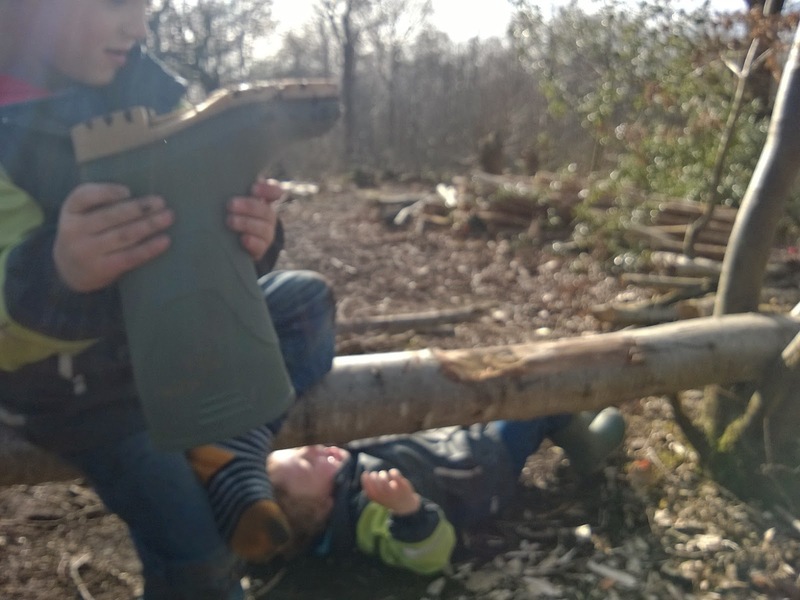 We started with Guitar, then a play date, then home for snacks and French and Phonics, then lunch followed by the afternoon spent in imaginative play in the local woods, where we also told stories, sung songs and chatted to dog walkers. The main game was part of a story Ollie was dreaming up about living in the woods, so naturally we needed a den and a campfire. 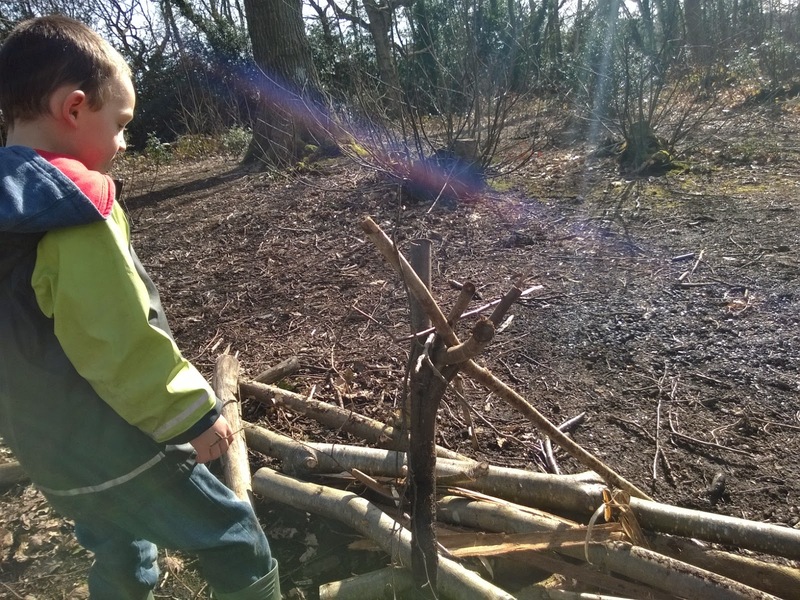 The boys worked co-operatively and showed perseverance in gathering the materials they felt were needed, giving and taking directions from each other and assigning themselves areas of responsibility. I could not have crafted a lesson plan to have as effectively drawn these features from them as simply going to play in the woods achieved with no pre-planning. 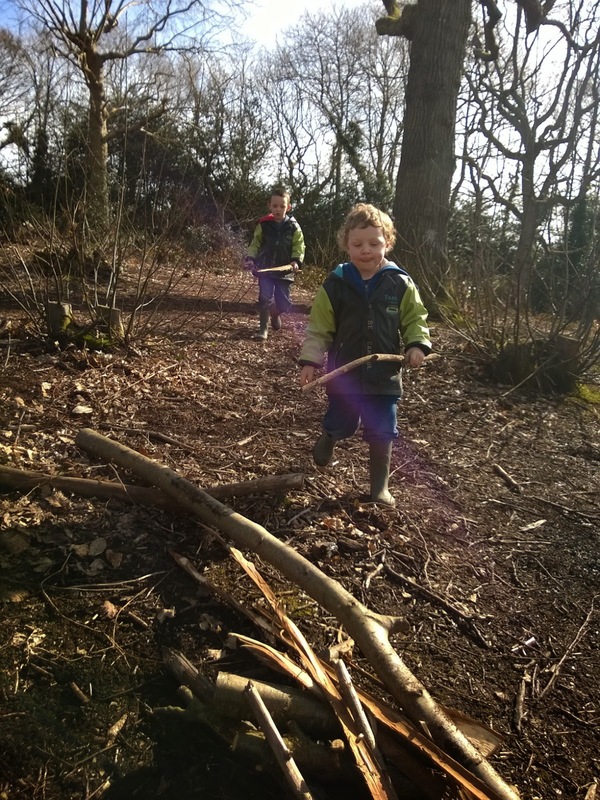 There were times the boys were feverishly active, and at others they just sat by my side on a log, eyes closed, faces up to the sunshine listening to the birds. I love the rich social element to our lives and frankly go a bit mental when I don't see friends for a few days, but I also relish these other times when it's just us and I am focused entirely on the boys. No housework shouting at me, no trying to hold on to the thread of a conversation with a friend in the midst of constant interruptions of 'I done poo! Wipe my bum!' and the like. Just us, the wind, the sunshine, the birds, the trees, the mud and the bugs. Ollie found he could swing himself upside down under a log. Toby found, repeatedly, that he could not, but he seemed to enjoy the sensation of falling off enough to keep doing it. 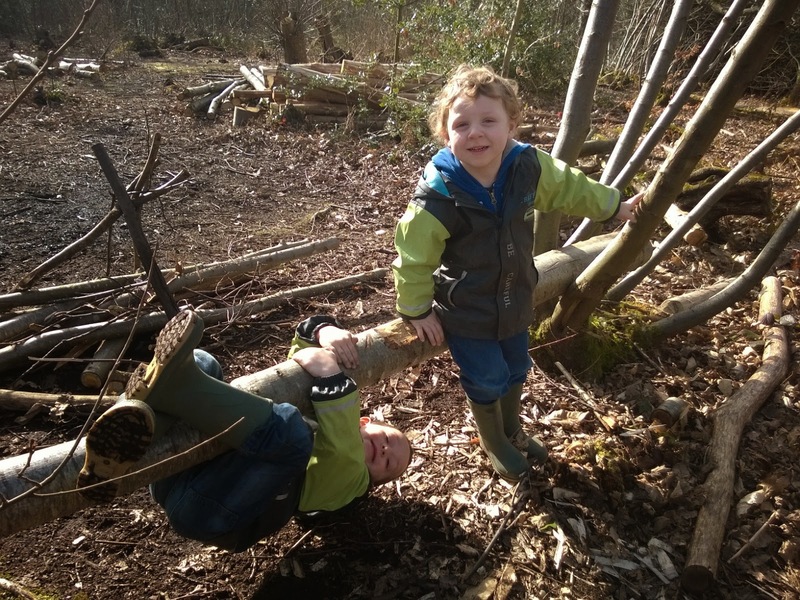 I have read that spinning around, hanging upside down and moving all parts of their bodies in all ways are vital to children's development of balance and the eventual ability to sit still. There's a theory that children fidget in class because they haven't had the opportunities to develop in this way. I think children fidget in class because they're children and their brains haven't yet learned to ignore the messages from their body that sitting still for long periods of time is horrible for your health. We watched little hunting spiders racing around on the log piles, and examined the perfectly sculpted tiny sporangia of the moss growing at the base of the coppiced sweet chestnuts. We talked about how coppicing works, why it was done to produce poles and wood for charcoal manufacture, what that charcoal was used for (the name of a nearby estate 'Tilekiln' gives a clue). We looked at newly coppiced areas compared to those with a full season of regrowth, and others that looked like they hadn't been cut for 30 years or more, and the difference this made to the light levels reaching the ground, and the flowers that would grow, and the butterflies that would come. 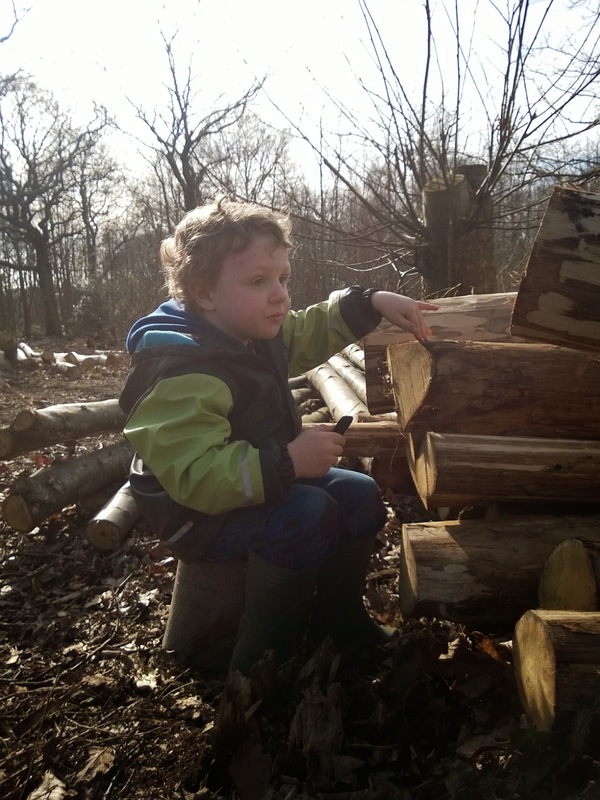 There was even time for what Ollie called 'arts and crafts' where the boys used charcoal they found to decorate the cut faces of the log piles before our slow meander home when the little voices piped up 'I'm huuuungry'. It all sounds pretty idyllic, and it was, but I don't want to put pressure on folks whose experiences of going out with kids may differ by not giving the full picture. This day was lovely, but we've had our fair share of whinging, griping, incessant demands for food, or the toilet, or being too tired on other days. We've had dog dirt. Lots of dog dirt. On this day our walk to the woods was marred by the discovery on the path running behind our house of a load of fly tipped pig parts including trotters, an abandoned cooker and a kettle barbecue. All of which had to be reported to the council when we got home. I walked home by a different route despite the protests of the boys who wanted to see the 'dead meat and flies' again (not sure if this is just because they're kids, or if our being vegetarian adds an element of interest in the less known). This different route took us through the thickest stickiest yellow clay you ever saw, which necessitated me standing outside for 20 minutes scrubbing boots under the outside tap. Fortunately the boys are now big enough to be given instructions to put dirty clothes by the washing machine and put clean ones on and to mostly do it first time, although sometimes it's 'funner' to run around with pants on their heads instead. Is doing stuff with kids tough? Often. It can be tougher than anyone would ever believe before they had kids. Just leaving the house with everyone dressed can be a major challenge in the early days. But the key to anything is perseverance - the same thing we want to see in our kids. So, you went for a walk after spending 45 minutes trying to get everyone out of the house, you got a bit lost, someone wet themselves, you had a moment when you thought you'd lose your mind if you told someone one more time not to put that stick up their nose.... if nothing else you had an adventure, the kids were away from four square walls for a couple of hours, you saw them light up inside when they got filthy and didn't get told off, and each time the outing gets easier, the kids get more self reliant and you get more and more idyllic moments to hold in your head for when you need it most.